Classified as a large sized dam by the Massachusetts Department of Conservation and Recreation (DCR) Office of Dam Safety (ODS) the Granite Lake Reservoir Dam has a maximum height of 20 feet and maximum storage capacity of 1,710 acre-feet. 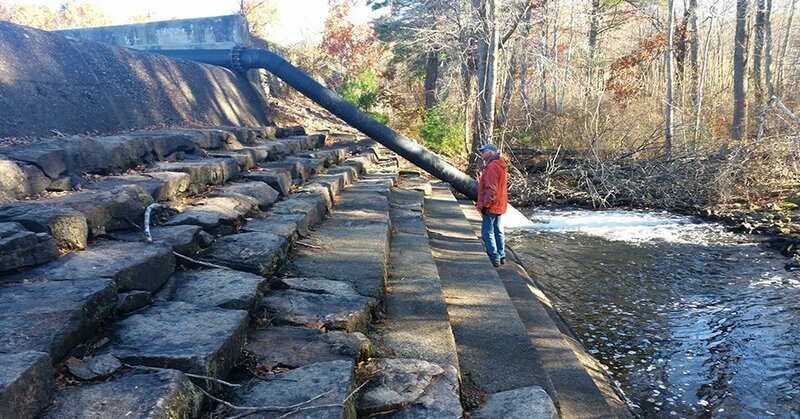 In 2015 and 2016, respectively, CDR Maguire performed a Phase I and limited Phase II inspection of the dam finding it in “Fair” condition as defined by ODS regulations. Constructed in the middle of the 19th century, the earthen dam provides recreation opportunities for the community and is classified by the ODS as a Significant hazard dam. CDR Maguire’s Phase I inspection recommended additional investigation for the presence of voids. A prior inspection in 2000 had identified seepage concerns and grout injection with follow-up remediations. Because of these concerns, CDR Maguire utilized divers and ground penetrating radar (GPR) to provide additional details on potential seepage sources. Once identified, CDR Maguire recommended additional armoring of the dam to prevent seepage flow. Additional recommendations included extending the rip rap face above the normal pool elevation for erosion control, pressure grouting for voids identified through GPR, general maintenance of the exposed concrete faces of the training walls, spillway and low-level outlet and the removal of trees from the downstream face of the dam. Implementing improvements to the dam, also required CDR Maguire to work with the town to negotiate access agreements from the dam’s private owners who are ultimately responsible for dam maintenance. CDR Maguire also prepared construction documents for the designed improvements and managed contractor selection through an Information for Bidders (IFB) process that allowed the selection committee to review bid price combined with contractor’s experience, their proposed schedule and approach to project delivery. CDR Maguire will also provide construction inspection during the project. Now in construction, substantial completion is anticipated for January 2019.